User Story: The Big Bus Trip. Posted 31st May 2012 by markjones in Accessibility, User Stories. 5 – 6am: We were up and getting all our gear together, we had a large holdall with bedding in, and two rucksacks with all our clothes, Last minute checks were done, and we set off to the Tesco Bus Stop in our hometown, Abergele to catch the first eastbound 12 bus to Rhyl, It was timetabled to arrive at 06:43, it arrived at 06:45. 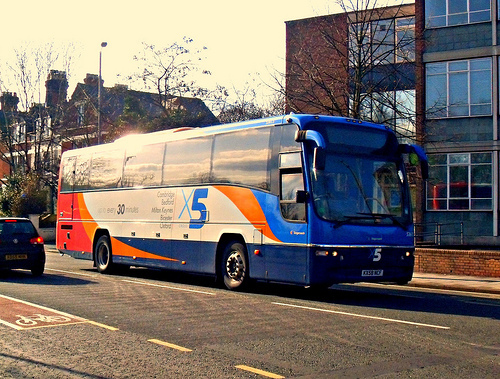 1 – 4pm: Transpeak is the connecting service between Manchester, Buxton, Derby and Nottingham, which has recently become part of the High Peak Bus Company (50% Trent Barton, 50% Centrebus) fairly recently, and it was quite nice to get a double decker on the run over to Derby. We left on time and arrived in Derby on time too – our first on time service! 4 – 5pm: Derby Bus station is nice and modern, but it’s a shame it is out of town, We caught the Skylink between Derby and Leicester, 10 minutes ahead of the bus we were meant to catch, and it was a nice, busy service as far as East Midlands Airport. 5:40: Leicester Bus Station is one of the worst bus stations I have ever been to. It was not very clear which Bus Stand we needed for our bus, and the people there were not very nice, We felt intimidated by a few people, and were glad to get out of there on the X7, which was 20 minutes late, The plus side being the bus was only 3 weeks old!. 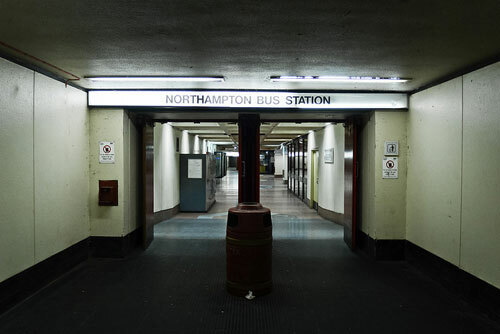 7:40pm: Greyfriars Bus Station is horrible, It is the sort of place where you don’t want to be for long, and we did not like the fact that the doors were not automatic, they were ones that you had to pull open, which given there were no signs for meant we had to guess. Luckily, Greyfriars is being demolished and rebuilt at some point in the future. 7 – 8pm: We caught a bus to the station, and went to purchase a ticket from the Ticket Office, Despite having valid Identification of my Disability, the Ticket Office staff Member argued it was not valid. I have raised this with London Midland, and you can keep track of progress here. We caught a train to Milton Keynes, it was on time. 8 – 10pm: We arrived in Milton Keynes and proceeded to immediately get lost! They have removed the Bus Stands from the Station Forecourt temporarily, and as such we found it difficult to find our way to our Bus Stop, Luckily a member of Bus Users UK (Milton Keynes) was on hand, and as he has a Sight Impairment also, was able to guide us to our stop. He remained and helped us on board the X5 to Oxford, which was the last bus (and it was 20 minutes late). We arrived in Oxford at 10:30pm, met our friend and proceeded to where we were staying. So. it is possible to make journeys across the UK solely by bus, but you do need to be able to think on your feet, as sometimes things can go wrong. If this has inspired you, then do let us know how you got on with your journey. Credit: Northampton Bus Station image by Nico Hogg; 2008 Volvo B9R image by Tom Ellis -both used with thanks under the Creative Commons licence.